Wildwood Retreat’s meeting, leisure and accommodation facilities bring new meaning to the phrase ‘roughing it’, where simple rustic charms combine with cosy comforts and fine food to ensure this is roughing it at its very best. Wildwood Retreat is regularly used by a broad range of groups, including family and friends, social clubs, church groups, and groups celebrating special occasions. The Retreat can be booked on a self-catering option where groups get the retreat exclusively to themselves, use of all kitchen facilities and a BYO licence, which provides them with total independence. 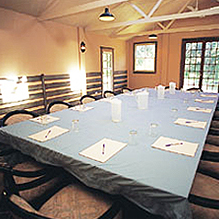 The Conference Barn is an ideal setting for all your meeting requirements. This stand alone venue is set amongst the lush grounds, overlooking Pennyroyal Creek and State Forest. With its rustic cobblestone floor and barn like feel, the Conference Barn offers a diverse range of settings only limited by your imagination!